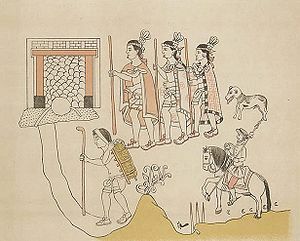 The Tlaxcalans, or Talaxcaltecs, are an indigenous group of Nahua ethnicity who inhabited the republic of Tlaxcala and present-day Mexican state of Tlaxcala. The Tlaxcaltecs were also instrumental in the establishment of a number of settlements in Northern Mexico (including parts of present-day southeastern Texas), where conquest of local tribes by the Spaniards had proved unsuccessful. They were taken to areas inhabited by nomadic bellicose tribes (known as the Chichimeca) to serve as examples for the local indigenous groups of sedentary model subjects of the Spanish Crown and to work in mines and haciendas. The Tlaxcaltec colonies in the Chichimeca included settlements in the modern states of San Luis Potosí, Zacatecas, Durango, Coahuila, Nuevo León—Nueva Tlaxcala de Nuestra Señora de Guadalupe de Horcasistas, today known as Guadalupe, and Santiago de las Sabinas, today known as Sabinas Hidalgo—and Jalisco (Villa de Nueva Tlaxcala de Quiahuistlán, today known as Colotlán). As of the 2000 Mexican census, there were more than 23,000 speakers of Nahuatl in Tlaxcala.